The policy under Kim Jong Il, North Korea's late Dear Leader, could not have had a name that was more straightforward: "military first politics." For most of Kim's 17-year reign as dictator, North Korea's military  the Korean People's Army, or KPA  got pretty much whatever it wanted. Even during the crippling famine, which killed tens of thousands in the late '90s, food was diverted to the military. Better a soldier with a full stomach, even if almost everyone else were starving, Kim seemed to think. "His position toward the military was one of weakness," says Christopher Hill, formerly the chief U.S. negotiator to the six-party nuclear talks. Little wonder, then, that nearly everyone who tries to figure out what is happening in the world's most isolated regime believes that, in the wake of Kim's sudden death on Dec. 17, it is the military brass who will be firmly in control of the country, even as the young Kim Jong Un formally becomes what the Koreans call the suryong (supreme leader). "The military," says Hill, "will clearly be a critical factor in determining whether the [Kim] family dynasty survives." 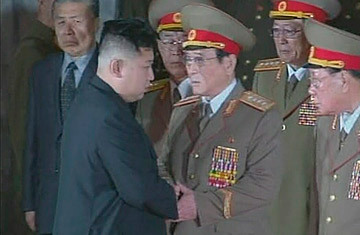 Some analysts have argued that the North Korean brass were already deeply resentful that Kim Jong Un, in his late 20s, was last year given four stars and a position as vice chairman of the Central Military Committee "without having served a day in the military," as Victor Cha, who ran Asia policy on George W. Bush's National Security Council, recently put it. "Such a system," Cha says, "simply cannot hold." This may overstate the regime's fragility, precisely because it underrates just how deeply rooted the Kim family dynasty is in North Korea and how deeply the KPA's interests are aligned with its continuation. The key man to watch, analysts say, is Vice Marshal Ri Yong Ho, chief of the General Staff in Pyongyang and, like Kim Jong Un, a chairman of the Central Military Committee, the key military policymaking body in the country. Ri, 69, is a third-generation elite who over the years established a close relationship with Kim Jong Il, and over the past two yeas was photographed at various public events seated alongside the late Dear Leader. He is also said to be close to Kim's sister as well as his brother-in-law Chang Sung Taek, the man who some believe is now Kim Jong Un's "regent," the power behind the throne who will be calling the shots. Ri is also a graduate of the Kim Il Sung Military Academy, as is Kim Jong Un. Diplomats and intelligence analysts believe there is no scenario under which the young Kim could have been elevated to the position of successor over the past two years without the brass's approval. "He's there because the military officials believe they can control him, at least for several years, and there's no other institution that can hold the place together," says an East Asiabased intelligence official. On Thursday, in fact, Reuters  quoting an unnamed official with "close ties" to Beijing and Pyongyang  reported that a "collective leadership'' arrangement has already been agreed to by Kim Jong Un and top military officials. (TIME has been unable to confirm this.) "The military has pledged its allegiance to Kim Jong Un," Reuters quoted its source as saying. Most likely, that is vice versa. The military's powerful position in North Korean society can hardly be overestimated. Not only is it the overseer of the country's nuclear program  the ultimate guarantor of Pyongyang's security  but it is also its largest employer. There are over 1.1 million soldiers in the KPA's five branches, or nearly 20% of the male population between the ages of 17 and 54. It is also, therefore, the country's most powerful economic entity, the largest consumer of goods in the country as well as an exporter of missiles and nuclear technology via the shadowy Second Economic Committee, run by a man about whom little is known in the outside word  Park Se Bong  except for his reputed close ties with the ruling Kim clan. "Again, the boy would not be in this position if people like Park had strenuously objected," says the intelligence source. "People are reacting too much to the so-called suddenness of Kim Jong Il's death. This is a guy who had a severe stroke three years ago. For a while there, he looked like death warmed over. The idea that the regime didn't have its ducks in a row, that everyone assumed the Dear Leader was going to be around for another decade or more, doesn't withstand scrutiny. And the regime very much includes the military." It's also critical to understand, a variety of sources say, that North Korea is nothing if not a "kleptocracy," as Hill puts it. The centrality of the KPA means that senior military officials get their beaks wet as much as anyone, calling in favors (economic and otherwise) whenever they choose. Consider a small, recent example: a TIME correspondent visited a newly opened university in Pyongyang a few weeks ago, one in which the students were pretty much all elite, politically connected kids. How connected? Remember that all other college students in North Korea this year were not attending classes; they were out on construction sites, building monuments and memorials in anticipation of the glorious 100th anniversary of Kim Il Sung's birth in April 1912. All college students, that is, except those at the Science and Technology University that TIME visited. There, a senior officer in the KPA with the rank of general recently visited the school's president, in order to arrange a place for his son. No freezing-cold construction sites for him, 100th anniversary of the Great Leader be damned. Loyalty to the Kim dynasty among the brass extends only so far; they do pretty much what they want, and it may well be that the young, inexperienced Kim Jong Un works for them now, not the other way around. See pictures of North Korea's heir apparent, Kim Jong Un.